The first sporting event I ever attended was an FA Cup 4th Round Replay at Ayresome Park between Middlesbrough and Everton. We were led on the field by Tony Mowbray, he scored an important goal and the rest for me was history. I met Tony and his then wife in central Middlesbrough a couple of years later and although his wife was terminally ill he gave me a couple of minutes of his time. The term hero, legend, great, superstar and even celebrity are widely over used in the world today and have now been over used in the sporting world too, none more so than football. Think back to yesteryear, the 1980s and 1990s when footballers were just that, footballers. The game’s superstars were actually people who could play football and the majority weren’t ‘pretty boys’, they just happened to be good at the beautiful game. Most of these footballers were local lads, playing for their local clubs and earning wages that could be recognised and associated with the average man in the terraces. What happened to those days? Everyone has their favourites and it’s always a pleasure to hear people’s preferences and the reasons behind their choices usually lead to fascinating stories or debates. 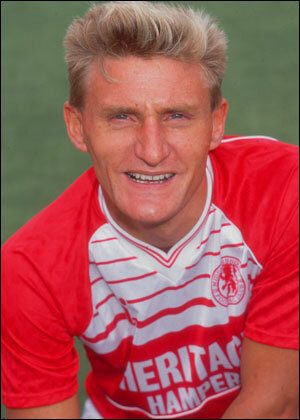 My personal favourite is Tony ‘Mogga’ Mowbray, such a legend, that the match day fanzine at Middlesbrough is technically in a roundabout way named after him. I have fondly followed his career until the present-day and he will always be a hero to me, a true local great of the game. Born Anthony Mark Mowbray in Saltburn in November 1963, he obviously became more affectionately known as Tony who then became more affectionately known as ‘Mogga’. He had an 18 year career with many high points including captaining Middlesbrough at just 22 years of age, gaining promotions with both Middlesbrough and Ipswich Town. He had the pleasure of playing north of the border at Glasgow Celtic and was the nemeses behind the infamous ‘Celtic Huddle’ though the reasons for this are different to those publically believed, namely the death of his first wife Bernadette. Whilst his playing career came to an end with a high, a play-off victory for Ipswich Town against Barnsley at Wembley Stadium in 2000, a game he actually scored in too. He decided to take the more advisable route into football management by becoming first-team coach at Portman Road. After a small stint as Interim Manager, ‘Mogga’ landed the Hibernian job in Scotland in May 2004. He enjoyed reasonable success at Hibernian, including two European qualifications in two seasons, and a football writers’ manager of the year award. Many also believe he laid the foundations for Hibernians’ Scottish League Cup win in 2007. ‘Mogga’ had moved on to West Bromwich Albion before this success, he’d moved in October 2006 and in his first season as manager they reached the play-off final, losing 1-0 to Derby County. In his second season they gained promotion to the Premier League winning the Championship in the process. His first season looks set to result in relegation, but Tony is destined for as great a career as a manager as he experienced as a player. My personal hope is that Tony one day becomes manager of my beloved Middlesbrough. Tony has re-married to Amber and they have two children, Lucas and Max. Interestingly Tony has been tee-total since the age of 19. He is a legend to me and many fans up and down the country as well as Scotland.